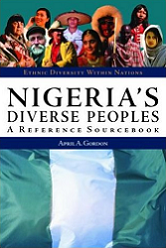 Exploring the history of ethnic, regional and religious diversity in Nigeria, this volume traces most of the country's current problems to its colonial exploitation. In many ways, Nigeria is a nation in name only, struggling to unite its diverse population. But age-old tribal hostilities are not solely to blame. The conflicts among Nigeria's major ethnic groups are also the legacy of European colonial influence as well as present-day political culture and ethnoregionalism.